And the rumor mill is at it again bringing spicy bits of speculation surrounding the release of the first Windows Phone 8 handsets by Nokia. According to a source from the far east, the Finnish manufacturer will unveil not one, but two smartphones running WP8. Supposedly, that will happen on September 5, which is when Microsoft is also expected to release more details regarding the development of Windows Phone 8. Although the credibility of the source can be questioned, the rumor might actually be on the right track. After all, Nokia World kicks off on September 5, and would there be a better opportunity for the company to present us with its first Windows Phone 8 devices? Besides, we know that Nokia has a surprise in stock for September 7, which could be the market availability of the WP8 smartphones in question. On the other hand, it is said that Windows Phone 8 devices might not debut until November of this year, although that does not necessarily mean that the handsets won't be unveiled a couple of months in advance. But as you should with any rumor, take all of the above information with a healthy dose of disbelief, especially since the source, WPDang, has no solid evidence to back up its claims with. Just arm yourselves with patience for now, folks, and don't get too excited until an official announcement comes from either Nokia or Microsoft. I know that Google owns Motorola and this will never happen, but it would be cool to see some Motorola phones running WP8. true , Imagine a WP8 Razr ! what's with all the thumbs down?? I love WP, and think Moto puts out some of the best hardware of any company!! A Droid 4/5 with that outstanding keyboard running WP? A Kevlar tuff WP? We can dream!! How bout a Motorola Droid RAZR WP8 phone, with KEVLAR backing, and 7.1mm THIN like the RAZR!! Hmmm.... I smell the inclusion of some Dual Core S4 chips in the upcoming Nokia WP8 handsets..
More power to you. I would consider BB10 long before the iPhone. And I haven't even seen them yet. Nothing wrong with Apple that can't be fixed by offering some options and not being overpriced. Hope Nokia will bring another ground breaking model into the market like the Nokia 808. Even though I'm wp i think nokia might not launch the there flag ship device on nokia world they reserve it for holiday session and won't give hint to other manufacturers what might be new benchmark/innovation!!! 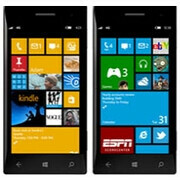 i hope microsoft will allow other chip makers to create a WP8! they only make phone on qualcomm phones... i hope that Texas Instruments OMAP, ST Ericson nova thor, NVIDIA tegra and even MediaTek for cheaper Windows phone! but on their windows RT they allow qualcomm, NVIDIA and TI to make tablets base on their chips!!! or maybe they dont allow other chip makers to make their own version on WP8 to avoid the bugs and lags.. even you hate to admit it, WP is really smooth and fluid! Yes, allowing more chipmakers would be great. As WP grows, I could see it down the road if the demand is greater than Qualcomm can supply. novathor is a sh%^ and wp is limited to one cpu architecture..they choose qualcomm..the good thing is that this cpu is no one else than S4 Krait in flesh. A Windows phone with a physical QWERTY keyboard would be nice. Portrait style, of course.